Hey friends! I’m excited to be joining some fantastic ladies again for the One Little Word series. 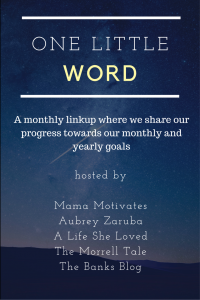 Each of us have picked out our focus word for the year and we’ll be sharing our progress towards our monthly and yearly goals on our blogs each month. My word for 2017 is Follow-Through. I’ve been struggling with my follow-through these past several years. I have plenty of excuses – I didn’t write it down, I got too busy, I’ll get to it, or I just plain forgot – but no good reasons for my lack of follow-through. I need to be reliable. People need to know that if I say I’m going to do something, I’m going to do it. I need to make reasonable timelines for projects and complete things on time. So this is where I’ll be focusing my attention this year – being reliable and following through. If that means saying “no” to more things (which is very difficult for me), so be it. But this exercise in self-discipline will be so good for me. Get back into our gym routine. The kiddos are finally enjoying child care, so there’s no reason that I can’t get regular exercise at the gym. I’ve started by picking out my favorite classes and putting them on my calendar so I know which days we need to get up and moving. Start some preschool work with the boys. We are going to start the year by focusing on one letter each week. We’ll practice recognizing it, writing it, and identifying some of the words that our weekly letter starts. For my dinosaur-crazy 3 year old, I may even find a dinosaur or two that start with our weekly letter so we can learn about those too. Run the dishwasher at night. I usually put off doing the dishes until bedtime and then I’m “too tired” to deal with loading and running the dishwasher at night. But waking up to clean dishes is so much more pleasant, so this month I’ll be making sure I run the dishwasher at night to help make my mornings just a little easier. What about you? Do you have a word for 2017? What are some of your goals for this month? Be sure to check out my co-hosts Aubrey, Ashley, Tayler, Sadie and see what their words are! My word is mommy. I need to focus on myself more and make sure my needs are being met so I have the strength and strong mentality to provide what my family needs from me emotionally, physocally, and psychologically.